Soothe the senses with these exotic instant chai tea blends created from the finest imported black and green teas. Enjoy traditional chai tea made with sweet honey, dairy-free creamers, and intoxicating spices from the Far East, including tahitian vanilla, clove, cinnamon, ginger, and cardamom. Chai Amore Chai Tea Latte, the "tea of love" is an all-natural superior blend in the traditional chai style, created from the finest imported black and green teas and formulated with sweet honey, dairy-free creamers and intoxicating spices from the Far East, including clove, cinnamon, ginger and cardamon. 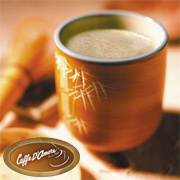 Indulge in Caffe D'Amore Chai Serenity Chai Tea Latte, specially blended to help you find peace-of-mind with every cup. Serenity Chai Tea Latte is made with the finest exotic spices from around the world. Buy now in a case of five 3 lb. bulk bags.